Attending or sponsoring at conferences and trade shows is undoubtedly hectic. Sales teams are hunting down potential prospects and the marketing department is focused on messaging to target audiences and finding the best events for their company to attend. 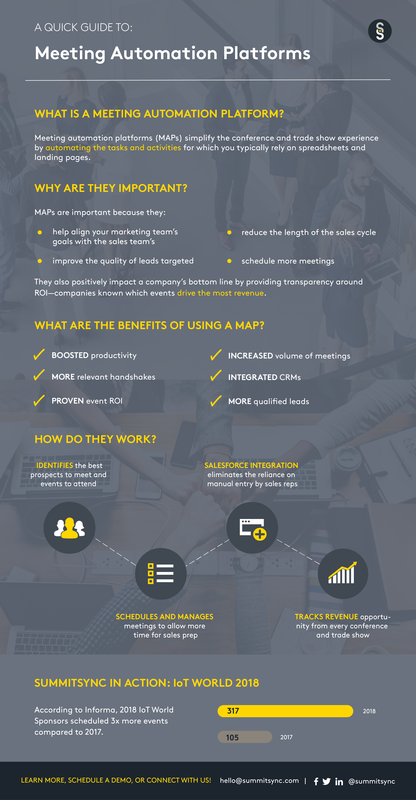 But when marketing and sales teams work together and plan out their conference meeting strategy, they provide valuable insights for each team to support one another. What conferences and trade shows yield the highest ROI for your organization? Which sales team members should go to which events? That’s where meeting automation platforms come in! What are meeting automation platforms? That’s the question on the tip of every B2B marketer’s tongue in 2019. Check out our quick, handy guide below to meeting automation platforms or download our new Ebook for more in-depth answers!